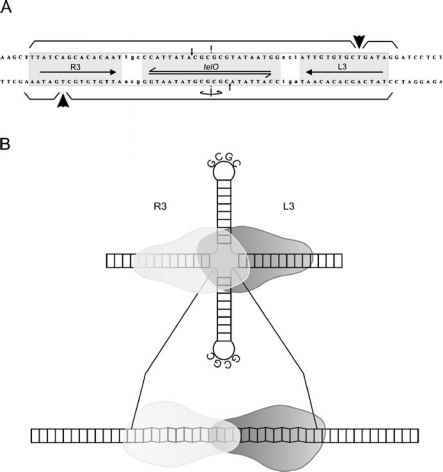 Eukaryotic linear plasmids, either mitochondrial or cytoplasmic, in principle replicate like genomes of adenoviruses and phi29-like bacteriophages (see above), which has led to the conclusion that they share a common ancestor (Meinhardt et al. 1986, 1990; Kuzmin et al. 1988; Oeser and Tudzynski 1989; Rohe et al. 1992; Kempken et al. 1992). 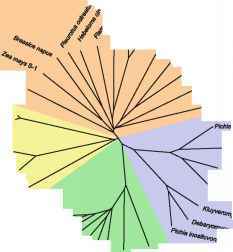 For reconstruction of the phylogeny, both DNA and RNA polymerases have been employed, since the respective genes were found in almost every linear plasmid system. Figure 4 shows an updated phylogenetic tree based on the viral B-type DNA polymerase sequences with basic features agreeing with previous calculations (Rohe et al. 1992; Kempken et al. 1992). Mitochondrial and cytoplasmic linear plasmids are clearly separated, which is indicative of early phylogenetic divergence and adaptation to different cellular compartments. Moreover, cytoplasmic DNA polymerases are more closely related to enzymes from adenoviruses than to those of mitochondrial plasmids. Along with the plant linear plasmids, which also reside in mitochondria, the latter form a separate branch. Adenoviruses as well as the bacteriophage PRD1 (which infects Gram-negative bacteria and employs a phi29-like replication mechanism) were recently shown to display clear similarities concerning virion structure (Benap and Steven 2000; Benson et al. 1999, 2000; San Martin and Burnett 2003). Such findings agree with the assumption that adenoviruses and (PRD1/phi29-like) bacteriophages have a common ancestor which predates the occurrence of eukaryotes (Davison et al. 2003). eukaryotes. In contrast, the distinct separation of mitochondrial elements from both cytoplasmic linear plasmids and adenoviruses suggests that mi-tochondrial elements diverged later, possibly in the postendosymbiont era. Consistently, plasmid pPK2 of Pichia kluyveri, one of the few known mitochondrial linear yeast elements (Blaisonneau et al. 1999), is more closely related to mitochondrial linear plasmids from filamentous fungi and plants than to the cytoplasmic linear plasmids from other Pichia species. In general, the relatedness of mitochondrial linear elements reflects the phylogenetic relations of their hosts (Rohe et al. 1992), suggesting them to originate from a single mitochondrial ancestor which may have been acquired as an endosymbiotic (bacteriophage-like) genetic element. In contrast to bacte-riophages and adenoviruses, linear plasmids lost almost all viral attributes (such as a capsid or an infectious cycle), presumably as an adaptation to the propagation mode of their hosts, since extranuclear inheritance, either as cytoplasmic or mitochondrial element, does not necessarily include an infectious virion for efficient propagation.